When people travel to the Gettysburg Battlefield in Pennsylvania, they typically stick to the marked route map when doing the driving tour to see all of the Civil War monuments and memorials. However, you'll find all kinds of Civil War monuments in Gettysburg (downtown) and the surrounding area. Many are off the beaten-path, so-to-speak. On one of our trips down to Gettysburg we located the Company K First Pennsylvania Reserves Monument in the downtown area. If you walk around Lincoln Square, you'll find it. Since it's related to our great state of Pennsylvania, I wanted to highlight the monument here on our blog. Here's what the posted information has to say about it. 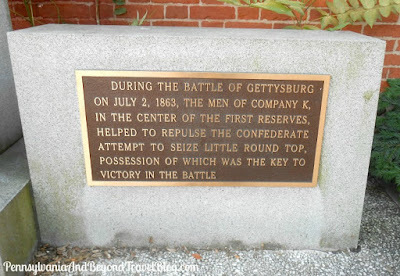 During the Battle of Gettysburg on July 2nd, 1863, the men of Company K, in the center of the First Reserves, helped to repulse the Confederate attempt seize Little Round Top, possession of which was the key to victory in the battle. Recruited in Adams County, the men of Company K participated in 8 battles: Mechanicsville, Gaines Mill, Glendale, South Mountain, Gettysburg, Wilderness, Spotsylvania, and Bethesda Church. The casualties sustained were 17 who died in service and 23 who were wounded. When you're walking around the downtown business and shopping district in Gettysburg, you'll want to look for the various monuments that are located in the downtown area. Along the way you'll find several of them, along with historical markers and information plaques. Even though they're primarily not listed on the "auto driving tour map", they're still an important part of history when it comes to exploring the Gettysburg Battlefield in Pennsylvania and learning about the Civil War.